We are headed for a battle. throw up in the air and arrange into theologies, there are a few major signposts that are given which, once realized, cannot be ignored. The prophet Joel calls them portents – signs and wonders pointing to something momentous, something calamitous. In this case, that something is the return of Jesus Christ to the earth, precipitated by what many consider to be…well, the end of the world. Somewhere in there, prophetically speaking, there is supposed to be what is called a rapture of the saints – the catching away of God’s people into the air to meet Christ. Presumably, at least by many Christians, this also serves as an escape route for the faithful. Those who believe otherwise would hotly contest such theories… and the debate rages on. We are now, however, ladies and gentlemen, coming to the end of the time for human reasoning; for skill and wit in argument; for “he who makes the better point.” For the end-times stage is set, the curtain is opening. It’s time to stop talking and pay attention. The final act is about to begin. The curtain opens to a scene in motion— back-stories built, characters in mid-sentence, action coming too fast and furious to be anywhere near the opening credits. And as you set your eyes to the Scriptures, and then to your world-screen, they will open to the numbing shock of the fact that you might be coming to the party a little late. What your eyes will see, jumping off of the pages into your real life, are these prophesied portents. Blood, fire, billows of smoke— signs in heaven, signs on earth—pointing us, thrusting us in one inevitable direction: the final battle. We are on the road to Armageddon. 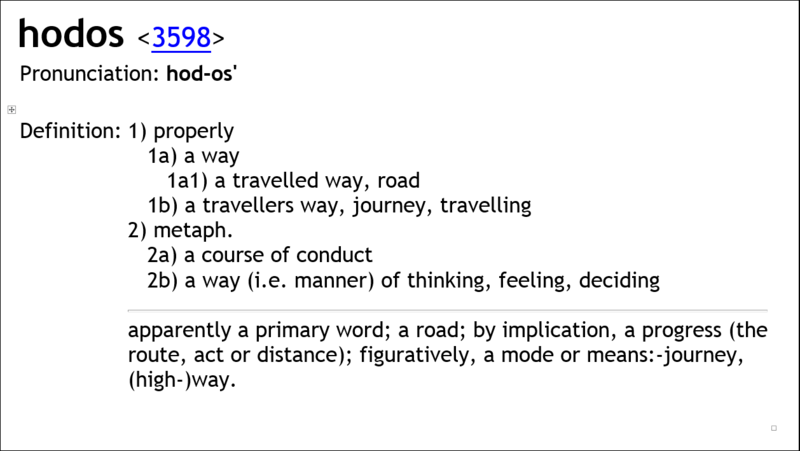 The Greek word for “way” in this passage literally means “road”. The New Living Translation assumes this to mean that the drying up of the Great River will remove a hindrance for these armies. In any case, this “road”, whether literal or metaphorical, leads to a very real place: Armageddon. And there is one very real, tangible, observable signpost that marks the timing of the nations’ trek to doomsday: the drying up of the ancient River Euphrates. We can further clarify where the drying up of the Euphrates will happen on the apocalyptic timeline by identifying which end-times events coincide with it in Revelation 16. The opening up of a road, or path, to Armageddon for the kings from the east. The appearance of the dragon, the beast, and the false prophet (Antichrist/ Antichrist government). The release of three unclean frog-spirits from the mouths of these three entities, to perform signs and go out to the kings of the earth. The gathering of the kings and their armies by these evil spirits to the place called Armageddon – the place of the final battle. In Revelation, there are seven seals broken, seven trumpets blown, and seven bowls of wrath poured out before Jesus Christ returns to establish His thousand-year reign. The drying up of the River happens when the sixth bowl of wrath is poured out. So, regardless of your theology, the fact that these are some of the very last events before the Day of the Lord is indisputable. What is shocking, and probably disconcerting for those with their theological ducks in a row, is a fact that could make every Christian re-examine what they think they know about prophetic timing. The Euphrates River is drying up now. otherwise arid region. This is where people first learned to use river water for irrigation, to plant seeds and grow crops—where human society developed, flourished, and spread. This is also the region known as Babylon in the Old Testament. 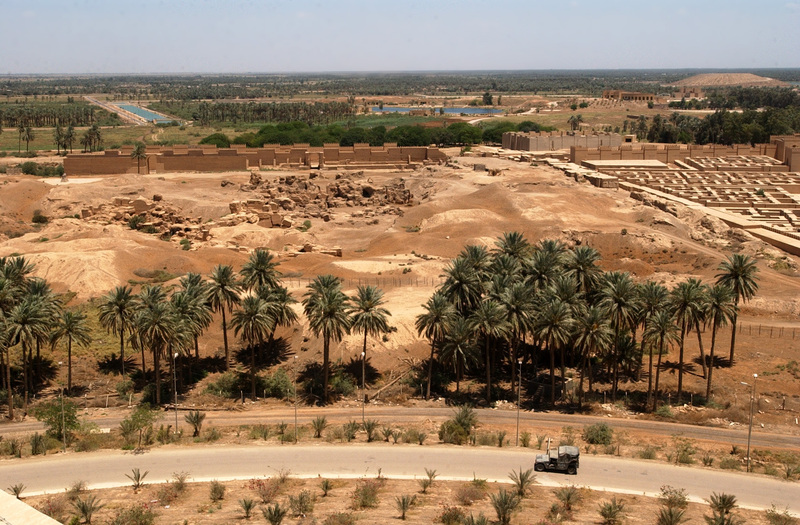 In Iraq today, the city of Hillah, one can stand in the former palace of Saddam Hussein and see the ruins of Babylon— the same Babylon that took Israel into exile for seventy years. Why is this phrase cryptic? Why the conjecture? Why the assumption that the prophet is speaking in metaphor? Because it doesn’t make sense to the “modern” reader (or the author of the text note) that such a historically fertile, watered place— one that has remained so for thousands of years, indeed from the birth of civilization— could become a desert. How quickly things have changed. The prophecy that Babylon will turn to desert is inextricably linked with the prophecy that its main water source— the Euphrates— will dry up. Such catastrophic changes take time, however, and are often difficult to perceive in their beginning stages. The alarm bells started going off in 2009. 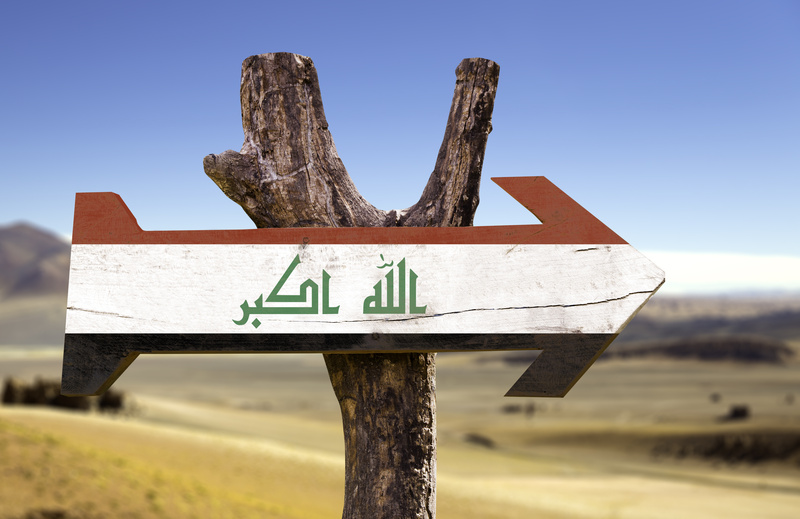 The internet lit up with prophetic warnings as Bible teachers and students picked up on several alarming reports, like “As Iraq Runs Dry, A Plague of Snakes Is Unleashed” (The Independent) and “Iraq Suffers as the Euphrates River Dwindles” (New York Times). Since then, sporadic reports about drought, decimated crops, and falling levels of the River have made their way to our Western ears. The most dramatic news came in the summer of 2014— a series of articles reporting the complete cut-off of the flow of the Euphrates into Iraq and Syria by Turkey. In a report by the Middle East Monitor (MEMO), one witness makes the shocking statement that “No drop of the Euphrates now enters Syrian territory.” Now that sounds apocalyptic. The truth is that the problem goes much deeper than one political move by Turkey. There are environmental processes with many contributing factors that have been brewing over the last few decades, which are culminating in the literal desertification of the region and the drying up of the River. These factors range from the tyranny of war to drought, from the salinification of the soil in the region to human manipulation of the River. 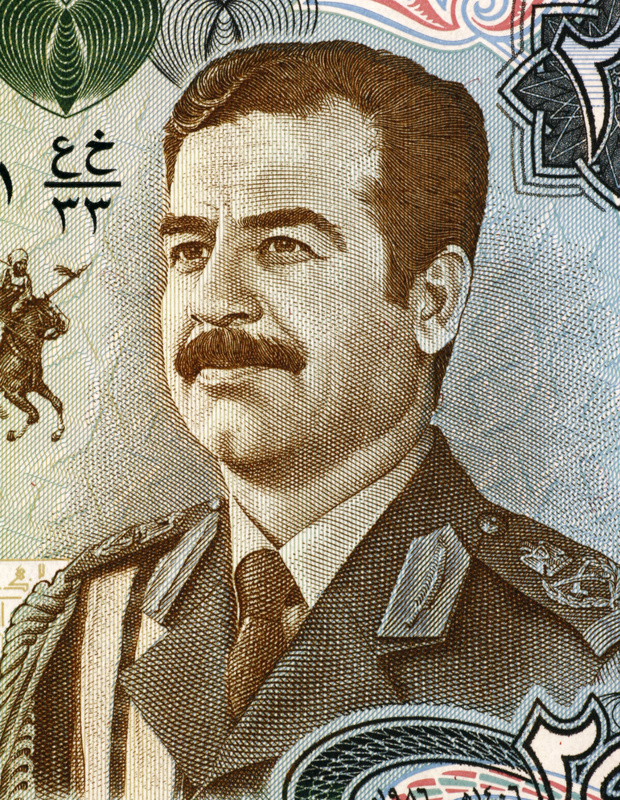 One major factor that helped turn the tide in favor of desertification was the brutal regime of Saddam Hussein. The dictator brought a new kind of terror to the region – the environmental sabotage of his own country. Saddam’s military vehicles loosened soil in green areas of Iraq, destroying the land as they moved through it. His forces chopped or burned down huge strips of vegetation in an effort to track down dissidents. 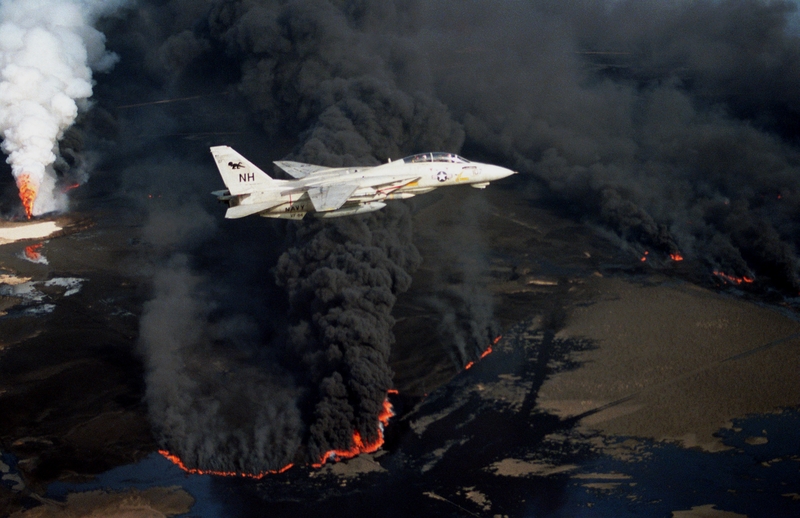 A U.S. Navy Grumman F-14A Tomcat flies over an oil well set ablaze by Iraqi troops in 1991. The Kuwaiti oil fires were not limited to oil wells, one of which is seen here in the background, but burning “oil lakes”, seen in the foreground, also contributed to the sootiest/blackest of the smoke plumes. 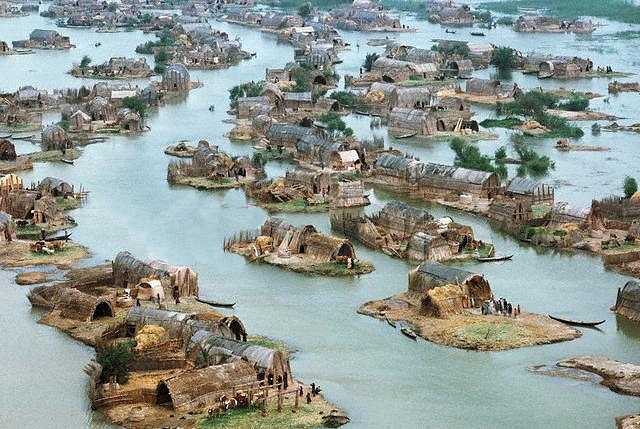 90% of the Iraqi wetlands were destroyed by 2000. That means in one generation, 20,000 square kilometers of marsh shrank to 2,000 square kilometers. (Lawler, 2005) The rest is now largely desert. Attempts have been made to restore what Hussein destroyed, but the marshes in the southeast that were intentionally re-flooded in 2003 are drying up again. (Robertson, 2009) Experts remain worried about the area’s long-term prospects, as the human demand for water cannot be supported. Droughts in Iraq and Syria are expected to become more frequent and extreme. The quality of the water has also been affected. Harmful farming practices, drought, and the reduced flow of the River have resulted in a sharp increase in salinization of the Euphrates. In fact, in a region once famous for its production of grain and Anbar rice, farmers who have not yet fled to the city to escape the ravages of drought dredge huge mounds of salt to sell instead of produce. Their crops can’t grow in these conditions; it seems the only thing left to do. Downstream areas have been hit the hardest, with salt and pollution levels so high that the water is unsafe for drinking or farming. As a result of the desertification of the area, dust storms have increased significantly in recent years. Baghdad now closes its airport frequently for dust storms. 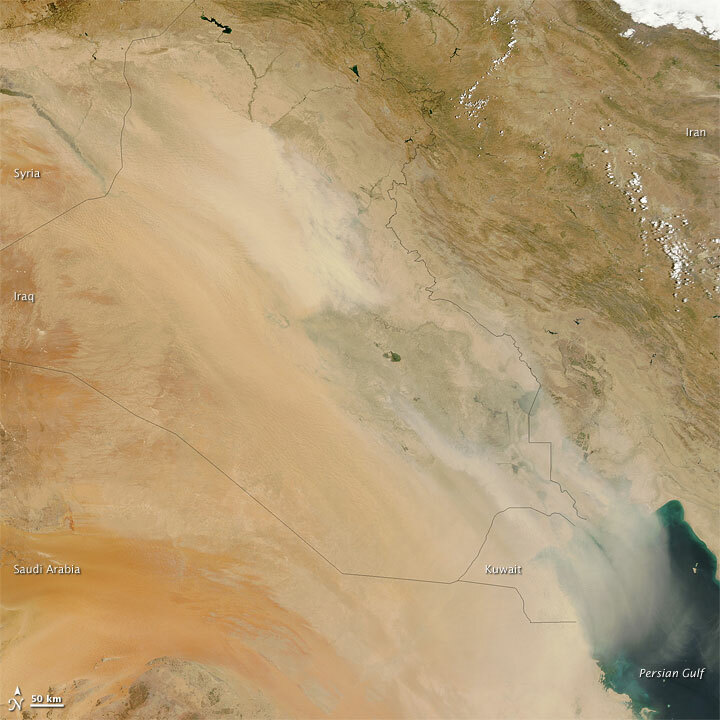 In 2009, Iraq was hit with the worst dust storm in living memory, which then spread to neighboring countries. The colossal storm was actually visible from space— NASA’s Aqua satellite captured these images of the phenomenon. Images acquired by NASA’s Landsat 5 satellite show considerable shrinking of the Qadisiyah Reservoir in Iraq between September 7, 2006 and September 15, 2009. In 2007, after more than a decade of drought, the Middle East was hit with one of the worst droughts in recent history. Reaching into 2008 and 2009, the drought decimated crops and depleted groundwater resources. Below is an animation of this catastrophic loss of water in the region from January 2003 to December 2009. As if these signs leading to Armageddon weren’t rushing upon us quickly enough, Turkey decided to up the prophetic ante in 2014. How? By cutting off the flow of the Euphrates…completely. The Euphrates originates in Turkey, then flows through Syria and Iraq. Water sharing has been a source of tension in the region. 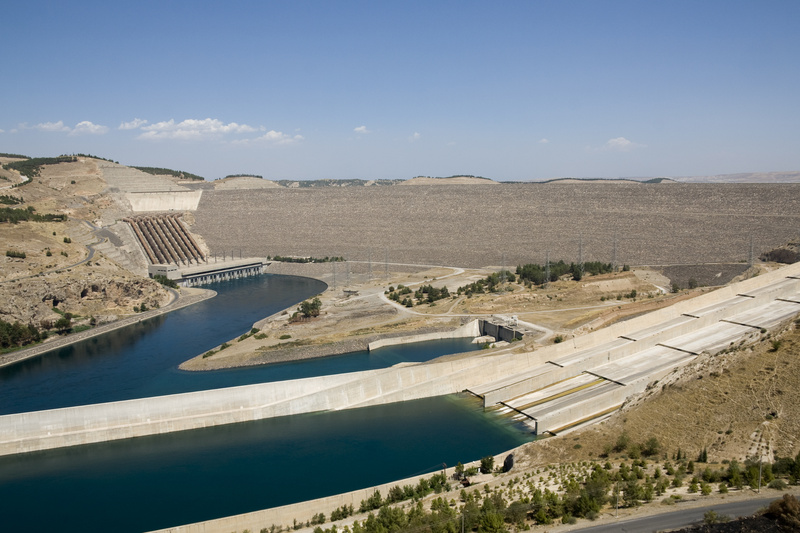 Turkey and Syria have undertaken multiple large water engineering projects in recent years, including the construction of dams and reservoirs on the Euphrates. Iraq has few other sources that feed into the River, making it totally dependent on the Euphrates for water, and putting it at the mercy of its upstream neighbors’ water policies. Turkey refuses to acknowledge that international water law applies to the Euphrates, controlling its flow at will. Iraq and Syria have suffered catastrophic damage from the significantly reduced flow. Agriculture in Iraq was so decimated by 2009 that this region, once known for its grain exports, was importing 80% of its food. A plague of poisonous snakes was reported that same year, as the reptiles’ habitat among the reed beds disappeared. One witness made the shocking statement that “No drop of the Euphrates now enters Syrian territory.” (al-Masri 2014) Reports since then have been sparse, and it is not clear when or if Turkey reversed this decision. Reckless water policies and irrigation practices, increasingly dry climate, depleted groundwater, and human demand appear to have put the region once known as Babylon on a one-way road to disaster. 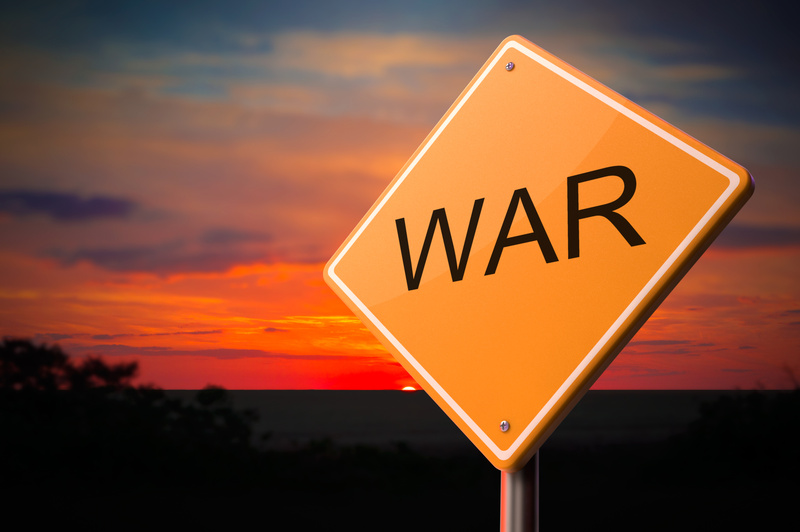 Even without the exacerbating circumstances of Saddam Hussein’s rampage, these end-times prophecies would be on course to come to pass in our generation. The signs, the portents have come into view. Watching the Euphrates begin to dwindle is like having a view from John the Revelator’s theater box. We are joining him, witnessing the first few drops of Revelation’s sixth bowl of wrath splashing into the Euphrates in slow motion…making the River a road. Like it or not, we are on that road. We are indeed headed for a battle. The question is, when we reach the final destination…whose side will you be fighting on ? Thanks Monica God bless you guys!!! Great to see you here, Penny, God bless you too! Indeed it has, John. We are experiencing God’s wonders, an amazing sight to see. God bless you my sister the times are short and this subject is necessary to cause a revival in the Christian communities. I thought you may want to know point of view from Islam about the Euphrates dried up. The Prophet Muhammad said: “The Hour will not come to pass before the river Euphrates dries up to unveil the mountain of gold, for which people will fight Ninety-nine of every hundred will die [in the fighting], . and every man among them will say, ‘Maybe I’m the only one to remain alive’. “- (Sahih Bukhari, Sahih Muslim).